My 8 year old nephew and I made this today. He built the pirate raft to use in the photo shoot. 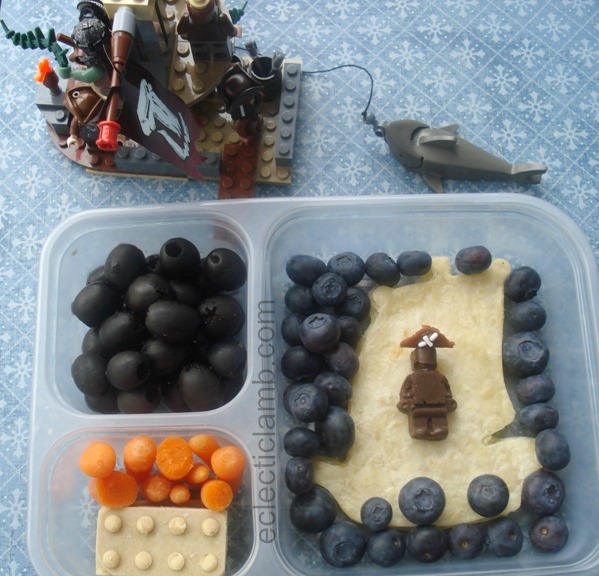 This entry was posted in Bento / Cute Food and tagged lego, lego lunch, vegetarian bento. Bookmark the permalink. A fun Bento… especially love the cannon balls/olives concept.. and of course the raft he built… I agree with Malachi… lots of detail. looks good! I think the “8 year old nephew” 😀 did a really good job. Love that chocolate Lego man! And your nephew did a great job with that pirate raft! Adorable! What a cute lunch idea! Thank You! Good luck with the Legomaniacs!